We’re thrilled to announce that Recipes for Repair: A 10-week Program to Combat Chronic Inflammation and Identify Food Sensitivities is now available at Barre Life! We love our clients and want to support any opportunities that allow them to become the healthiest, happiest versions of themselves. Not only will we have copies of the book in the studio available for purchase, we will also be participating in the 10-week program that starts on January 15. 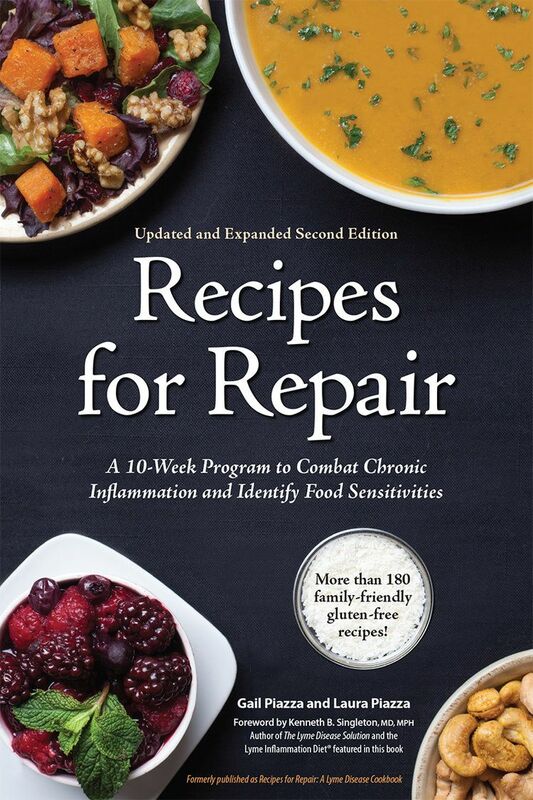 Published by Peconic Publishing, LLC in Sunapee, NH, Recipes for Repair: A 10-week Program to Combat Chronic Inflammation and Identify Food Sensitivities is an award-winning book by Laura and Gail Piazza. It is a complete guide for adopting the Lyme Inflammation Diet© authored by Kenneth B. Singleton, MD, MPH. The recipes are written specifically for the highly acclaimed diet, outlined in the book. Of the 182 recipes, 161 are dairy-free, 155 are vegetarian, 136 are egg-free, 111 are Paleo-compliant, and every single recipe is gluten-free. “Food-based Healing is Possible.” This is a line from the foreword of Gail and Laura Piazza’s newly updated recipe book, Recipes for Repair, a 10-week, four-phase plan with 182 recipes created specifically for individuals fighting chronic inflammatory conditions and food sensitivities. This concept rings true for NH resident Laura Piazza, as she grappled with misdiagnoses and chronic illness and has found a change in diet has helped to alleviate some of her symptoms. In 2009, after finally being diagnosed properly with Lyme disease, Piazza discovered The Lyme Disease Solution, by Kenneth Singleton, MD, MPH. His views on nutrition and healing piqued her curiosity, but didn’t excite her taste buds. So she called someone with four decades of experience developing recipes for high-profile clients – her mom, Gail Piazza. Wanting nothing more than to help her daughter feel better, it was natural for Gail to use her culinary talents to develop delicious recipes that adhered to the diet. As a direct result of her dietary changes, Laura’s persistent stomach pains, indigestion, heartburn, acne and throat congestion eventually resolved. This success inspired her. She wanted others to benefit from the diet and her mother’s recipes the way she did. With Laura’s credentials as a professional photographer and graphic designer, and Gail’s food expertise, they would publish a cookbook specific to Dr. Singleton’s diet, who also authored the book’s foreword. In the spirit of making positive changes to your health for the New Year, Piazza will be offering a free event on Friday, January 13 at 6:30 p.m. at the Barre Life studio at 944 Elm Street. She will share the story behind the creation of her book and discuss which foods to avoid or enjoy when suffering chronic inflammation. She will also explain how nutritional changes can help minimize or eliminate some symptoms of inflammatory or autoimmune conditions. She will wrap up by touching upon the importance of prevention and early treatment of Lyme disease. She will also be providing delicious recipe samples from the book so participants can see for themselves how tasty the recipes are and will have signed copies available for purchase.